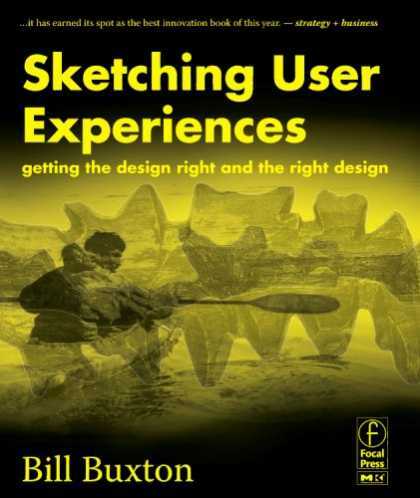 Last fall, I took a Human-Computer Interaction course offered by Stanford’s Scott Klemmer on Coursera, and one of the books he recommended was Bill Buxton’s Sketching User Experiences. Subtitled, ‘getting the design right and the right design,’ the book is highly engaging and full to the brim with rich content. Published in 2007, the title is a few years’ old in a space that is constantly evolving as technology continues to advance and innovations in design abound, but the principles Buxton espouse transcend specific technologies or implementations of design paradigms, and thus, I believe the book will have a premiere place on the shelf of anyone that has anything to do with user experience design for a long time to come. A major goal of the book is to discuss best practices, specifically in an area that is common to the design of all things, whether physical products, software, hardware/software combo, or services. The central thread among what could be perceived as a disparate collection of “things,” is the concept of “sketching the user experience.” Buxton’s use of the term “sketching” is much more broad than you might think, which could be a drawback for someone that wants to focus on developing better literal sketching-with-a-pencil-or-marker skills, though he does address the topic, and has since published a companion workbook with some colleagues that supplements this book well in that regard. When I put the book down, I felt “sketching” referred to a collection of activities, perhaps best described by “discovering, thinking of, experimenting with, tinkering with, planning, and ultimately, capturing and representing” various complete user experiences, including less tangible things like the space between objects, screens, points in a process, and states, and the motivation for choosing to engage or not, deciding when to disengage, and whether to return. A designer or design team’s ability to accomplish that set of activities relies on using many, many tools that go beyond the pencil and paper sketch, though the simple sketch holds a very significant place in the arsenal of design weapons. One of the things I liked best about this book is the way Buxton reasons about design. For every point he makes, he raises and tackles the counterpoint as well, making for some very convincing reading. His writing has a noticeable scholarly bent to it, which I found refreshing in a field where many books are about passing trends or the latest technological approaches to design. Buxton makes a strong case for the development of much more robust curricula and design programs in higher education, while also imploring industry to take design more seriously, especially at the C-level. Still, this book is full of practical advice; it just happens to be very well backed up by research. Buxton’s passion for design jumps off of every single page, and I think this makes his writing very compelling. It’s hard not to get sucked in by a writer who is not just excited about what he writes about, but also frustrated at every turn that there are so many gaps in the literature, so many companies that don’t “get” design, and little to no formal study of the history of the field, as you would see in other arts. Don’t get me wrong; this isn’t a book that’s about complaining. To the contrary, when Buxton points out issues, he also offers solutions, which is largely what makes this book so useful. I particularly liked that one of his aims was to “lift up the covers” about design thinking for the benefit of non-designers, while placing responsibility on both groups to put some effort into understanding each other’s language, challenges, goals, and processes. He repeatedly emphasizes that different types of resources belong in the design process playing different roles at different stages, and I think he does an excellent job illustrating, for example, how engineers and designers complement each other, but do so best when they are utilized the right way. I strongly recommend this book for designers and non-designers alike, along with its Workbook companion. Even if you think you have a job that has nothing to do with experience design, you will walk away richer for the experience of having read it. 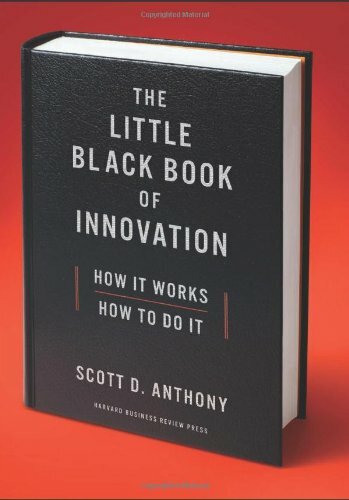 Scott D. Anthony’s book, The Little Black Book of Innovation, is a quick and pleasant read. 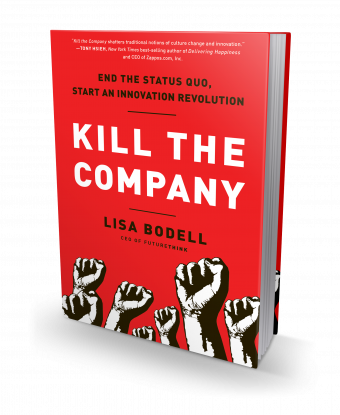 For those of us that think we aren’t as innovative as we could or should be, this book provides a practical approach to developing your innovation capabilities. Anthony draws on years of experience both practicing and teaching innovation, and presents his perspectives in a 4-week program made up of actions that will help you become more innovative. The four weeks break down as shown below. I’ve added one lesson from each week that particularly resonated with me. The first week’s activities are designed to help you identify your target customer, identify a problem the customer is trying to solve today, and find signals suggesting customer dissatisfaction with the status quo. Day 5, titled “Find Compensating Behaviors” is devoted to the central question, “How can I find nonobvious opportunities?” I love this advice because it instantly changes my mindset from one of attempting to dream up “something big,” to one of examining what’s out there already and where it falls down. We all use compensating behaviors all the time, often unconsciously. A silly example that pops to my mind immediately involves my morning coffee. I make myself coffee as soon as I wake up, and I drink it throughout the day. I take my coffee with milk and sugar, and I would imagine that at least 7 of 10 times, when I pour milk from the big plastic gallon container into my cup, I spill just a little bit, no matter how careful I try to be. I compensate for this by keeping a sponge nearby, and wiping up the drips of milk that have run down the edge of my cup. This isn’t a particularly big deal, but I can’t imagine there isn’t a way to design a spill proof container for milk. It’s been done for plenty of other liquids – why not the milk jug? The second weeks’ activities are designed to help you use multiple sources of inspiration to develop an idea, determine where your idea will be “good enough,” and develop a comprehensive blueprint for your idea. I found the advice on day 11, “Avoid Overshooting,” to be well aligned with design and development processes that I already subscribe to, and something I know people struggle with all the time. The central question in this section is, “Is there such a thing as too good?” The answer depends on the context, but it is certainly possible to build something that is “too good.” Take web design, for instance. People that are part of a software team often think of, or come across, new feature ideas. There is a cost to building a feature, though, and that cost varies with just how fancy you want to get. When something simple will do the job and satisfy the customer, it may not warrant the extra investment to make it flashier than it needs to be. Week 3 is all about assessing the true potential of your ideas, and I think this is something that innovators naturally struggle with. As the originator of what seems like a great idea, it’s very tempting to move full steam ahead without stopping to assess whether the idea is the right one. On Day 18, Anthony presents the important step, “Test Critical Assumptions.” This exercise first gets you to define your assumptions, and that in itself can be very illuminating. Then, the exercise prompts you to get out and back those assumptions up with testing. Going back to my milk carton example from Week 1, one of my assumptions is that I’m not the only one annoyed by dripping milk, but do I really know that’s true? Even if it’s true to a degree, are people annoyed enough that they’d pay for what may end up to be a more expensive gallon of milk if the cost of producing packaging is higher? If I really wanted to pursue my genius idea for a new milk carton, I’d be smart to test my assumptions before I go very far forward. Week 4 covers a lot of obstacles and pitfalls related to managing innovation within existing business environments, in order to position a company and its people to be successful innovators. On Day 26, Anthony says, “Reward Behaviors, Not Outcomes.” I don’t know about you, but practically every place I’ve worked at, outcomes are valued above behaviors. I’ve seen this work negatively in a few ways. First, a rotten coworker can get away with being rotten if he or she delivers. Or, a really innovative thinker can be punished when a particular idea doesn’t work out in the long run. It’s this case that Anthony is specifically targeting. It can take many, many failures before a success is achieved, but if the behavior is rewarded, employees will keep trying, anyway. On the other hand, punish people for ideas that don’t turn out, and they’ll quickly turn into automatons. Anthony uses a few metaphors and examples here and there throughout the book that I didn’t particularly like, but they don’t harm his overall message, which is valuable, practical, and quite accessible to anyone interested in becoming more innovative. 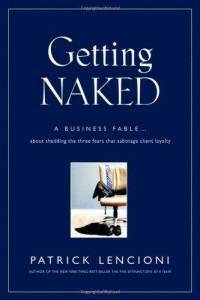 Getting Naked: A Business Fable about shedding the three fears that sabotage client loyalty, written by Patrick Lencioni, is a quick read that presents its lessons in an interesting format. As the title of the book indicates, it’s a “Business Fable,” and the author’s premises are shared within the context of a story about a high-powered management consultant that must attempt to integrate a newly acquired consulting firm with his. The firms involved share wildly different operational philosophies and the narrator undergoes a significant transformation as he spends time getting to know the new firm and its employees. While the book is primarily targeted at consultants, its lessons can easily be applied to anyone in a service role, and really, that means all of us. Even if you don’t operate in a service capacity at work, you inherently serve others in your personal life, one way or another. Lencioni is an accomplished figure in business, one of the most sought-after speakers in the country, and this book is largely about his own firm, The Table Group. He has published a host of other titles, the most popular of which focus on the function or dysfunction of teams. The author does not refer to any particular business or management theory, but I drew a strong correlation between the above behavioral principles and the concepts of Servant Leadership. This book would be a good addition to the reading list of anyone interested in Servant Leadership. The presentation of the material in story form makes it surprisingly refreshing. If you have a couple hours to spare, I’d recommend reading this. The story format was captivating enough that I read it from cover to cover in one sitting. 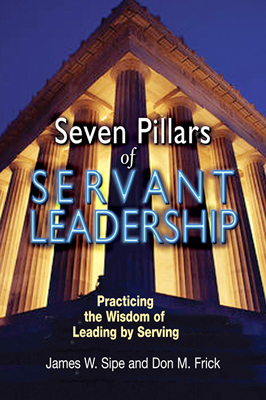 James W. Sipe and Don M. Frick wrote Seven Pillars of Servant Leadership as a means “”to be concrete about how to implement Servant Leadership, without turning Robert Greenleaf’s formulation – leading by serving first – into a collection of “tips and tricks.”” Servant Leadership is one of the lesser-known theories of or approaches to leadership, largely because in the industrial era, effective management was thought to be performed best by individuals that could delegate, create well-defined jobs, and instruct others on how to perform them. It was a top-down approach, and employees were expected to do their jobs and little more. Servant leadership relies as Sipe and Frick note, on serving before leading, which turns traditional management techniques on their head. Greenleaf wrote extensively on the topic of Servant Leadership, but most of his writing was conceptual and somewhat abstract. Sipe and Frick do a good job in Seven Pillars of defining characteristics that are central to the effective Servant Leader and discussing their implementation. In Seven Pillars, the authors repeatedly ask the reader to question herself – to perform a vast personal exploration, which is required in order for her to truly know herself. Each chapter includes many ‘Ask Yourself,’ questions that help the reader get to her own intentions and feelings about human interaction and leadership. The pillars themselves are self-explanatory, and the list may not look new. Perhaps with the exception of Moral Authority, employees would easily list most of these characteristics if asked to define what they believe makes a good leader. I believe the power of Servant Leadership lies in the effective and consistent combination of the above characteristics within leaders, and also in the intentions of those leaders. It’s hard to rank the elements in the list in terms of importance because they are all vital to the Servant Leader. However, being a person of character that puts people first and is compassionate (not just in collaboration) seem to me to form the foundation of a true Servant Leader. How can I reposition myself so that what I do is congruent with what I know I should do? Are there sufficient reasons for me to even try? Is my mentoring about me or the person I am mentoring? Can I tell stories that demonstrate my personal values? What are my anger warning signs? How can I discriminate between intuition and personal wants or needs? How comfortable am I with complexity? Do I secretly feel good about having power over other? If so, what is one thing I can do differently today to share power with others? Finally, the book includes a useful chapter on implementation, which prescribes five categories of questions and actions that can be applied to any organization to help move it in the direction of becoming a servant led organization. The categories will look familiar to the everyday business person – Discovery, Desire and Incentives to Change, Learning, Practice, and Feedback. I recommend this book to anyone interested in developing a personal plan to become a servant leader, and/or to developing an organizational plan to weave servant leadership throughout the fabric of the organization. For more on leadership topics, visit Simon Teague’s Leadership Expert site. 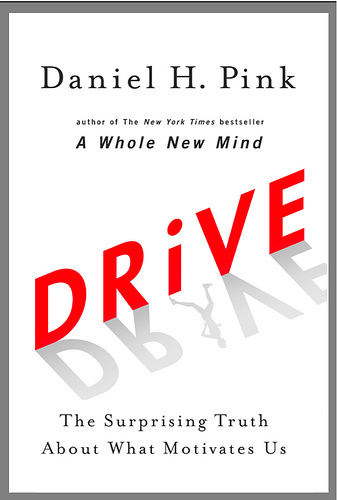 In the book, Drive: The Surprising Truth About What Motivates Us, Daniel Pink methodically describes what many of us have intuitively known for some time about motivation. There is a difference between intrinsic and extrinsic motivation, and the kind of motivation that companies use has an impact on our long-term job satisfaction. The main premise of the book is that extrinsic motivators, or “carrots,” may increase motivation in the immediate term, but can have two significant negative impacts. First, when people are offered cash or some other short-term incentives to achieve something, it narrows their focus to the specific goal set before them, and often results in less creative or robust solutions. They are so concerned about reaching the goal that they become myopic in their thinking. Second, when some bonus is tied to an immediate goal, we seem to subconsciously classify the work as undesirable. If it were desirable in and of itself, we wouldn’t need a bonus to do the work. Studies cited in Drive illustrate how people that are intrinsically motivated to do a task can lose that motivation when rewards are associated with the work – even if they enjoyed the work before the rewards were tied to it. While the research overwhelmingly shows that short term rewards effectively destroy motivation and productivity for many kinds of tasks, it also explains that a “carrots and sticks” approach to motivation does work when the tasks are rather mundane and don’t require thinking. Short term rewards worked well in the Industrial Age, when much of the work employees were asked to do was manual and followed a predefined pattern that one simply had to learn and execute. The difference? This work was never intrinsically rewarding to begin with, so there is little risk that the rewards will harm motivation. Pink suggests that today’s businesses deal with financial compensation by offering enough to take base compensation off the table, so to speak. When employees feel fairly compensated, they will pursue work because they want to, not because they are given additional rewards for doing so. Since the economy tanked a few years ago, though, many companies have been able to under-compensate employees. Layoffs were common, and employees accepted pay cuts out of fear of losing their jobs altogether. This puts many businesses in a particularly difficult position as the economy begins to recover. Not only do they need to look hard at bringing compensation back up to where it was previously, but they also need to deal with the damage that under-compensation caused. Pink also describes what does motivate us in Drive, such as autonomy, responsibility, room to experiment, fail, and learn, and verbal appreciation. In Silicon Valley, cutting edge technology companies have long been known for what some view as extravagant perks for employees. Google is famous for feeding its employees and providing massage therapists, among other things. Many companies have created “play spaces,” with ping-pong tables, video game systems, pool tables, and more. Automattic, the company that gave us WordPress, has a no limit vacation policy, employs people largely from their homes, and regularly assembles the whole team for meetings in various places all over the world. Other large Bay Area employers have on-site gyms, dry cleaning and laundry services, and employ hair stylists so that employees can take care of their errands while they work. Many employers still offer none of these types of benefits, but I would submit that the companies that do clearly illustrate their understanding of the fact that our view of motivation needs to change. They recognize that they employ whole people that have varied needs and desires, one of which is to feel valued on a broad level. I don’t know many people that would turn down more cash for the work they do. However, I do know many people that would choose a job that pays an average, but fair, salary and offers them a place to grow while demonstrating an authentic desire to contribute to their happiness over a job that pays a bit more, but doesn’t seem to care about how its employees feel, or what truly motivates them. 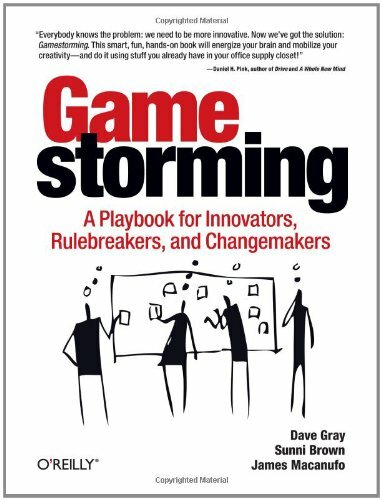 In the book, Gamestorming, Dave Grey, Sunni Brown, and James Macanufo have documented a wide variety of brainstorming games for use in problem-solving situations. While I haven’t made my way that far into the games themselves yet, I appreciate the introductory material, which offers some structure around the game concepts. First, the authors stress the difference between the goals of brainstorming games and critical thinking. Critical thinking is largely about analyzing, reducing, simplifying, and eliminating alternatives – evaluating options to choose a path forward. Brainstorming games are all about generating ideas – making space for creative discovery, cross-pollination of ideas among diverse people, and creating a ‘game world,’ in which new, unexpected ideas arise. The authors define a starting point, A, and an ending point, B, and the space between them is referred to as the Challenge Space. In Gamestorming, the idea is to move from point A to point B, but not necessarily in a linear fashion, and they recommend having Fuzzy Goals. Fuzzy Goals, they say, are emotional, sensory, and progressive. Because the goals are not precise, “the way we approach the challenge space cannot be designed in advance, nor can it be fully predicted.” Experimentation, exploration, and trial and error represent approaches that are important to successful Gamestorming. Gamestorming struck me as a useful practical and tactical tool, in that it’s packed full of various games to employ with any group that needs to generate ideas and solutions outside the context of their normal, structured, operating process. It also represents a practice that works well with Complexity Theory. Because ideas emerge from a system based on relationships and interaction between the people in the system, games like those described in the book could be invaluable tools that support the emergence of new ideas. By getting people in a room together, and encouraging them to interact in new ways, you put them in an environment that is designed to foster unpredictable outcomes. In many cases, especially in the business world, teams work to predict and to eliminate disruption caused by unplanned for events. Complexity theory, though, tells us that unpredictable outcomes are not only inevitable, but can be harnessed if we approach them in an open-minded way. This book is just one example of how we can apply complexity theory to practice. I highly recommend the book, especially for those of us that sometimes need outside ideas to get us started along the path of creative thinking.